Royal Ceramics Lanka PLC, signed an agreement with Pakistan's leading premium brands retailer SFnZ & Co. Ltd to expand into the Pakistani market. 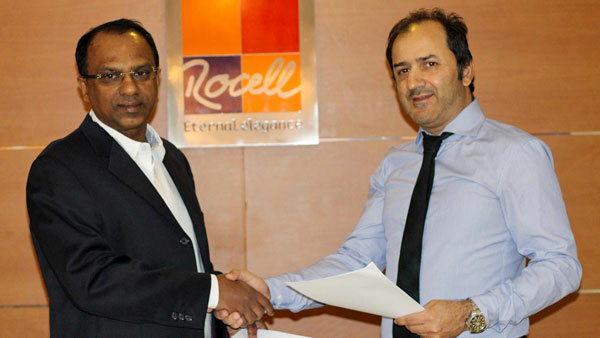 Royal Ceramics Lanka PLC Managing Director Mr. Nimal Perera and SFnZ & Co. Ltd., Chairman, Nadeem Ansar inked the agreement in Colombo recently. The joint venture agreement covers the export, trade and retail of Royal Ceramics products in Karachi and Lahore.The agreement will see the two parties collaboratively opening flagship stores in Karachi and Lahore in the coming year. An estimated 35 million people live in the two cities and Pakistan is one of the fastest growing markets in South Asia. Commenting on the agreement signing, TharanaThoradeniya, Director - Marketing & Business Development stated, "We set ourselves an ambitious goal of becoming a global tile and bathware manufacturer and in 2015. We have made inroads into the US market, Australia and now we are happy to sign up with Pakistan's leading premium brands retailer SFnZ & Co. We will continue to expand our global footprint in the New Year." In July 2015, Royal Ceramics Lanka PLC opened its first international showroom in Melbourne, Australia. The showroom designed by renowned Australian architect Terry Davis is an out-of-the-ordinary two storied Rocell showroom, featuring a comprehensive and customized product range for the Australian market. Laying the ground work for the entry into the North American market, Royal Ceramics participated in the prestigious Coverings '15 exhibition held in Orlando, USA in April. 'Coverings' is a premier international trade fair and exhibition, the largest of its kind in North America dedicated exclusively to showcasing the newest in ceramic tile and natural stone.